Sometimes we need a little twist when we are catering or perhaps a little inspiration for an easy party menu. Lamb leg chops marinated in balsamic vinegar, rosemary, garlic and olive oil. Monks Beard with grated parmesan (a different vegetable that tastes like spinach does, when you don’t squeeze the water out of it). 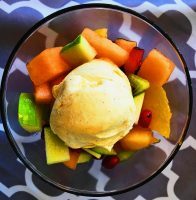 For dessert I went old school a huge bowl of fruit salad and ice cream. 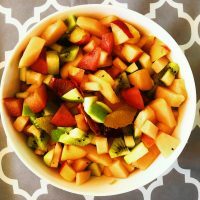 I had forgotten how much fruit salad you make with just a few pieces of fruit. Sometimes keeping a gathering simple and adding a few interesting vegetables or an interesting sauce can make for a memorable meal.